The three-year LIFE-Inno.Pro.Wire project is nearing completion. The project has been carried out in partnership with Officine Maccaferri and Radici Group and was funded by the LIFE+ Programme of the European Union. 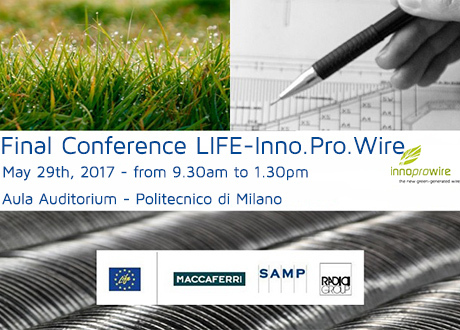 The final conference relative to the project will take place on May 29th at the Aula Auditorium in the Politecnico di Milano , Milan from 9.30 am to 1.30pm. All of the phases of the project will be presented during the conference which aims at raising awareness on environmental sustainability issues about engineering solutions for protecting the territory against hydrological instability. Speakers, project partners and stakeholders, will present the best practice to optimize the development of eco-friendly solutions. Industry experts will introduce case histories on technical solutions for low impact hydrological instability. The Milan Association of Engineers has recognized 3 CFP to this event. It has been required formative credits also for geologists.